and drew 6 x seperate rooves. and traced the same pattern on some scrap fabric to cover my walls and rooves. laying the cardboard cutout flat against the fabric I glued down the top of the eaves and the walls, I left the sides open since I would be sewing them together anyway. I scored the floor (square you can see in the middle of my cardboard cutout above) lightly with some scissors so they would bend along the fold more easily. I then glued some felt to each of my rooves. Your house will now look like this, you can trim the fabric back on the inside but I left it for tutorial purposes, you won't see it anyway once the roof is in place. Now cut out some black felt circles to stick on the front of your birdy house (as the hole) I blanket stitched around mine to make them neater. I love these!!! just saw them on Hostess with a Mostess,just gorgeous, what a beautiful party it was.. 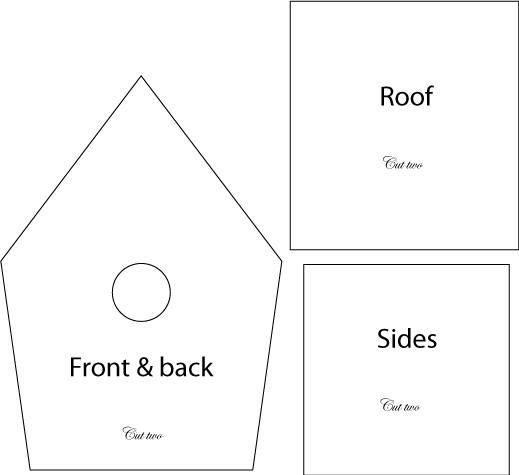 I realize you did these several years ago now, but do you have the actual measurements for the sides, front/back, floor and roof by any chance? I printed out the template, but I am afraid my printer made everything smaller to fit on an 8 1/2" x 11" sheet of printer paper. I think your hand (in the photo) on the cardboard makes it look larger than my printout. These are so, so cute and I would really like to try and make one. Thanks so much! Your party must have been a great success! The floor of the box should be 9cm square. The hight of the back wall is 15cm all x 9cm wide and the side walls are 8cm tall by 9cm wide. I love these but I don't think I could ever make them. You make it look so easy! I wish I was a craftier person! We need to play rich online. รอยัล1688 It is a casino website. Gclub has a long way to enjoy the hundreds of famous online gambling games. The player can become a winner by just playing a little game, because the game online gambling today, we can easily beat the gambler who is playing. All online gambling games that I would like to play. Because on the web page. Our online casino offers a wide variety of online casino games and services, including bonus and jackpot bonuses. All players are eligible to win bonuses after the risk is registered with the web site Poipet. Our casino, whether it is a bonus or a jackpot, the player is eligible to win a prize.